The Toyota Tacoma has long been a very popular compact pick-up truck, and it’s very easy to see why. On top of the attributes of sturdiness and reliability, the Toyota Tacoma also lays claim to having a well-built and easy-to-operate interior, good day-to-day usability and some pretty impressive off-road credentials. However, the Toyota Tacoma isn’t all perfect, with the limited interior space being perhaps the biggest bugbear. Also holding the Toyota Tacoma back are the many leaps forward made by the truck’s major rivals – which, if anything else, put further scrutiny on the Toyota’s more marginal niggles. All in all, the Toyota Tacoma is a good truck that we feel is worth putting on your radar. However, given the strength of a majority of its chief competitors, we’d hesitate on suggesting you place it at the top of your compact pick-up shopping list. The Toyota Tacoma’s cabin control scheme also impresses. As expected from a ‘workhorse’ vehicle, the Toyota Tacoma is quite sturdily built – with the interior being a prime area to notice this. Though the quality of the materials used can’t quite match those of the Honda Ridgeline, the Toyota Tacoma is trimmed on the inside to a good standard, and overall fit-and-finish is rather satisfactory too. The Toyota Tacoma’s cabin control scheme also impresses. All of the main interfaces are logically laid out and easy to reach, and the main touchscreen infotainment system that dominates the dashboard is clear to read and responsive to inputs. Sadly, interior space is lacking in the Toyota Tacoma. Sadly, interior space is lacking in the Toyota Tacoma. Overall head room is rather lacking, meaning those above six footers will find themselves rubbing against the truck’s roofline, and leg room in the back is tight in the four-seater ‘Access Cab’ and five-seater ‘Double Cab’ variants. For sure, the supportive seats and the good amounts of adjustment in the steering wheel do claw back a bit of ground, but we’re more inclined to recommend the likes of the Chevrolet Colorado and GMC Canyon to you if you’re over six-foot-tall or intend adults to use the rear seats in your truck. Things do improve when it comes to practicality, however, Those cramped rear seats do at least double well as additional storage (especially on ‘Double Cab’ models, which allow you to fold the rear seat backs down to form a flat load bay), and cubby spots like the glovebox and the storage compartment under the front center arm rest are of a good size. You can also specify the Toyota Tacoma with either a five-foot or a six-foot flatbed, depending on which bodystyle and trim you opt for, and the presence of a damped tailgate is an especially handy feature. The current Toyota Tacoma is a noticeably more civilised truck to use on a day-to-day basis. In comparison with its predecessors, the current Toyota Tacoma is a noticeably more civilised truck to use on a day-to-day basis. Perhaps the easiest area to see this improvement is in the main control inputs: whilst the response at lower speeds is a bit sloppy, the steering is more direct than before and well-weighted at highway speeds, and the strength of the brakes does offset their ever-so-slightly grabby nature. Factor in the good overall visibility, and the Toyota Tacoma becomes a relatively easy compact truck to drive in more built-up areas. The Toyota Tacoma also fares fairly well in terms of ride quality and noise refinement. Whilst it can be a bit bumpy over especially rougher surfaces, the ride is overall taut and well composed, and body motion is also fairly well contained considering the height of the vehicle. Likewise, noise insulation is very well suppressed, with barely any wind noise and tire roar entering the cabin at freeway speeds. The towing capacity of the Toyota Tacoma also isn’t the best you’ll find in this segment. However, as good as the Toyota Tacoma is in these areas, it isn’t the nicest truck in this segment to drive: the Honda Ridgeline, for example, is noticeably better when it comes to ride quality and refinement, and rivals like the Chevrolet Colorado and GMC Canyon aren’t too far behind the Honda’s standards. As stated already, the Toyota Tacoma is still good to drive, but it’s a way from being the class leader in this regard. The towing capacity of the Toyota Tacoma also isn’t the best you’ll find in this segment. At 6,800lbs, the Toyota Tacoma does trail behind the 7,700lbs that the Chevrolet Colorado is capable of. That said, this isn’t the worst you’ll find in this segment: the Honda Ridgeline, for instance, only has a maximum towing capacity of 5,000lbs. 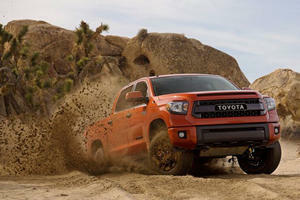 Where the Toyota Tacoma starts to claw back some ground, though, is in its off-road ability. In its standard guise, the Toyota does do a fairly good job at tackling tougher terrain, and a good way ahead of every other compact truck in this class. Better still, two off-road-centric trims (‘TRD Offroad’ and ‘TRD Pro’) of the Toyota Tacoma are available, complete with more specialised equipment and features to satisfy the needs of trail-traversing enthusiasts. If your budget stretches far enough, we’re more inclined to suggest the more flexible 3.5-liter six-cylinder gasoline engine. The two most basic grades of Toyota Tacoma come with a 2.7-liter four-cylinder gasoline engine as standard, which we reckon you should replace with the optional six-cylinder if your budget stretches far enough. 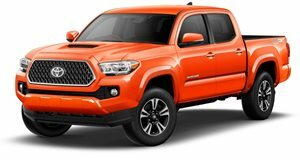 With outputs of 159-hp and 180 lb-ft of torque, the four-cylinder isn’t particularly punchy, so will struggle with getting the Toyota Tacoma up to speed when towing or hauling a heavier load, and the claimed economy figures of 19mpg city/23mpg highway also aren’t eye-opening for a four-cylinder engine in a compact pick-up. If your budget stretches far enough, we’re more inclined to suggest the more flexible 3.5-liter six-cylinder gasoline engine. There’s much more pulling power as a result of the 278-hp and 265 lb-ft outputs, and the fuel economy isn’t too bad for a six-cylinder engine, with the official estimates claiming a respectable 19mpg in the city and 24mpg on the highway. All Toyota Tacoma models come with a six-speed automatic transmission. The only real downside with the 3.5-liter engine is that it’s quite expensive to specify in certain circumstances. Depending on which version you specify, opting for the six-cylinder increases the list price from $2,495 to a whopping $4,995, so we’ll let you decide whether the attributes of this engine are worth paying that much for. All Toyota Tacoma models come with a six-speed automatic transmission, and overall, it’s a fairly good (if not breath-taking) unit that suits the characteristics of both engines fairly well and does a satisfactory job of smoothly selecting the most appropriate gear. Buyers who specify all-wheel drive also have access to an easy-to-use six-speed manual transmission on all but the two most basic trims – though it’s worth pointing out the lower list price is offset somewhat by a sizeable fuel consumption penalty. A majority of buyers, however, will likely be more satisfied with the ‘SR5’ specification. Initially, the Toyota Tacoma doesn’t appear to offer great value in comparison with its rivals. With a starting base price of $24,120, the Toyota Tacoma in its most basic ‘SR’ spec is noticeably more expensive than the equivalent Chevrolet Colorado ($20,055) and Nissan Frontier ($18,390) – albeit admittedly far cheaper than the $29,475 Honda Ridgeline. The Toyota Tacoma also comes with a good amount of equipment as standard. Even the most affordable ‘SR’ models come with a reversing camera, Bluetooth connectivity, eight airbags and a tilt/telescopic steering wheel – though we’re not quite sure how much useful the GoPro camera mounting point will be to most buyers. A majority of buyers, however, will likely be more satisfied with the ‘SR5’ specification. Whilst noticeably more expensive at $26,205, this trim level does at least introduce features like cruise control, satellite radio, a multi-function steering wheel and navigation functionality that help justify the premium. Add in the $2,495 six-cylinder, and you’ll have a dependable Toyota Tacoma in a good spec that’s also, coincidentally, competitively priced against like-for-like rivals. 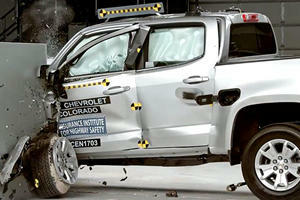 In its most recent crash test, the truck was able to score four-out-of-five stars in its most recent NHTSA crash test. Other trims are available for the Toyota Tacoma, ranging from more off-road-centric versions like the $31,740 ‘TRD Offroad’, the more opulent ‘Limited’ trim that starts at $38,795 and the $40,760 ‘TRD Pro’ model that’s essentially a hybrid of the two aforementioned specs. However, these versions do have more limited appeal, so we’ll let you decide if those versions are ideal for your requirements. Safety-wise, the Toyota Tacoma does fare rather well. In its most recent crash test, the truck was able to score four-out-of-five stars in its most recent NHTSA crash test, and higher spec models can be fitted with useful safety items like rear parking sensors and blind spot monitoring systems. However, the Toyota Tacoma isn’t quite the safest vehicle in this class: the Honda Ridgeline, for instance, was awarded the full five stars in its crash test. Mechanical durability should also be fairly strong on the Toyota Tacoma. The truck to date has a very good reliability record, so there shouldn’t be any need to make a claim under warranty. Also worth pointing out is that, whilst the three-years/36,000-miles bumper-to-bumper and five-years/60,000-miles powertrain warranties aren’t amazing by class standards, they’re also identical to what’s offered on all of the Toyota Tacoma’s rivals. In summary, the Toyota Tacoma is a well-rounded compact pick-up that does perform rather well in certain areas. For example, the truck’s towing capacities and equipment levels are pretty competitive, it’s fairly manoeuvrable considering the vehicle’s size and none of the Toyota Tacoma’s rivals can match it for off-road ability. 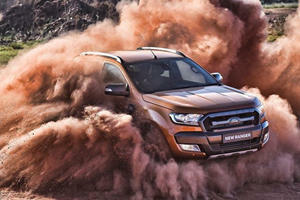 However, there are areas where the Toyota Tacoma lags behind its competition. In terms of ride quality and refinement, the Toyota Tacoma isn’t quite up there with the class best, and taller people will find interior space to be lacking. There are also other compact trucks that can be bought for substantially less money if all you’re after is an affordable and basic work vehicle. All in all, the Toyota Tacoma is a good compact pick-up truck that some appealing attributes and a distinct off-roader USP. However, considering the strength of its competitors, the Toyota Tacoma doesn’t quite rank up there as one of the best offerings in this sector. It's honestly surprising it's taken this long. The IIHS recently found out that it couldn't recommend a single midsize truck to safety-conscious buyers.